Why? Well, there are many reasons why sold inventory should be taken off a dealer’s website fairly quickly. It is very important to maintain a healthy ratio of Total Units to Sold Units on your site. You never want a large percentage of the inventory on your website to be ‘sold’. Not only is it an inconvenience to potential customers but it also causes huge frustration for someone who was ready to buy that unit only to find your dealership does not have it any more. Your website is there to attract potential customers and get them to buy what you have, not to aggravate them and send them running to your competition. How you handle your sold unit pages will affect your organic rankings with Google. If Google sees a bunch of 404s emanating from site they will be telling them that your site has a lot of errors and that wastes your crawl allowance. For those of you who don’t know, crawling is how Google (or any search engine for that matter) searches the web and your website for relevant, up-to-date information in order to index your web pages. Having a bunch of 404s or irrelevant pages will cause your website to lose ranking in the search engines. If done for too long this can damage your website’s overall ranking that you’ve been working so hard for. “Is this dealership still in business?”, “Are they going out of business?”, “Is this even a legitimate dealership or is it someone trying to scam me?”, “Are they going to promise me something they can’t deliver on or flat out don’t have?”. These are just a few of the thoughts that could be going through a visitor’s mind when they come across your website, especially if most of the units they want to look at are ‘sold’. In addition to this, having too many sold units on your site will create frustration and anger among potential customers to your site. If this continues for too long your hard-earned reputation will start to tarnish in the eyes of the public. After a while, your dealership will start to get the reputation of never having what people are looking for, not maintaining its website and, in the mind of your potential customers, just not caring. And once that conclusion is made you will lose valuable sales and leads. With too many sold units on your site, visitors and potential customers will start to feel let down every time they are looking for a unit on your site and that will eventually push them to take their business somewhere else. So what do you do when a unit has been sold? How long do you keep the sold unit on your website before you take it off? How do you handle links to units that are already sold without losing potential buyers? These are all good questions. Generally speaking you don’t want to leave potential buyers to your site hanging. You don’t want to have them click on a link to a unit and be met with an error message because the unit they are looking for is sold. At the same time, as discussed above, you don’t want them clicking on a link to a unit that they are excited about only to find out after inquiring further that their dream RV or trailer is already gone. There are a few ways to handle this situation that can be more satisfying for both you and your potential customer. One is to put a big ‘SOLD’ across the picture of the unit so that the second they are aware that it has gone home with someone else. Still disappointing but not as frustrating as pursuing something that’s not there any more. Another way to handle this situation is to take the pictures and information about the unit off the page but add a “Gone Camping!” message like the one below. This is the method that we suggest our dealers use on their websites. It provides an upbeat, fun way of showing that the camper has found a home. However, that alone is not enough. You also should show your potential customer some similar units that you have for sale. Doing this immediately alleviates any frustration they might have especially when they see you have several others JUST LIKE the one they were looking for! This raises the odds that they will continue to look at your in stock inventory and find the unit they want and purchase it from you. This protects your reputation as well as it instantly gives your prospective customer a solution to their problem. 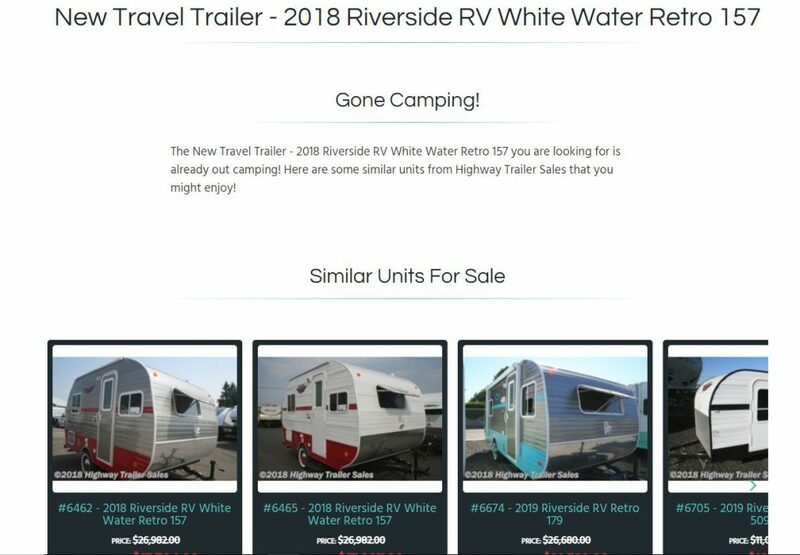 Every website that NetSource Media builds for its dealership clients will place the “Out Camping” message and several similar units at the bottom of the page automatically as soon as the dealer marks any unit on the website ‘Sold’. This is not necessarily the case with dealer websites built by other companies. NetSource Media created this built-in, no effort solution for our dealer clients in order to make handling sold units easy for both dealer and customer and prevent all the issues discussed in this article. So, how long to you leave the above page up on your website? There are no hard and steadfast rules but generally taking it down within 5-7 days of being sold if people are finding it via a link that you shared on social media or an ad is sufficient enough time. That gives people finding their way to your site from said links enough time to take action should they wish to. 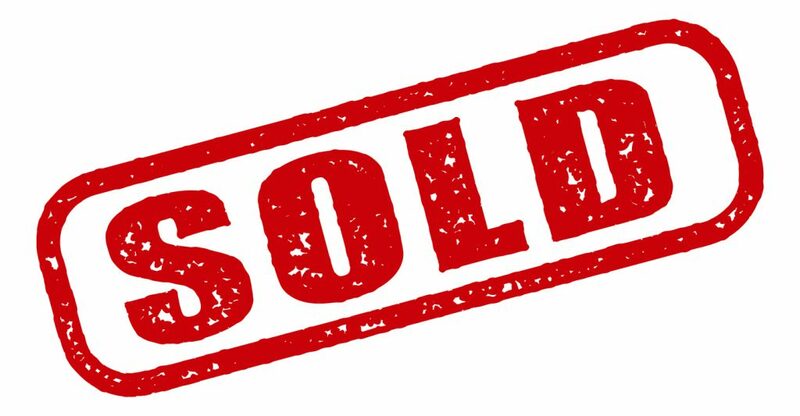 However, if the sold unit hasn’t been advertised or shared on social media recently, then taking that page down within a day of it being sold should pose no issues. 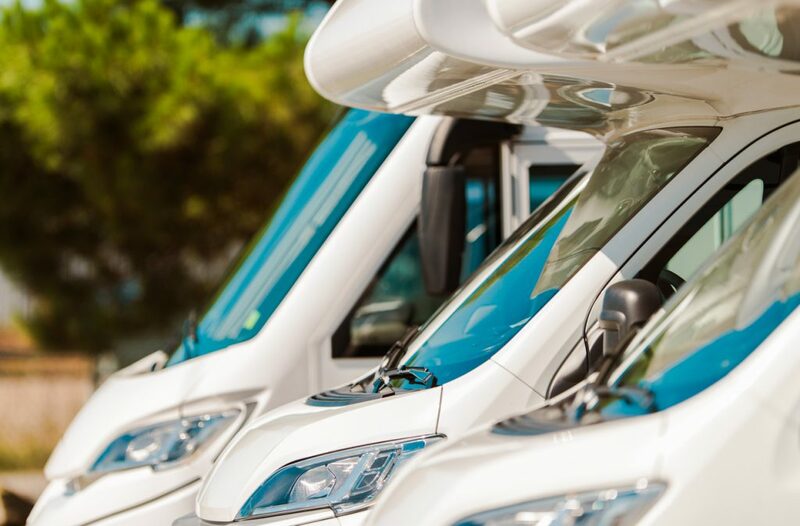 NetSource Media specializes in creating specialized solutions for RV, Trailer, Power Sports, and Marine dealerships from custom websites to content management systems to social media and SEO creation and management, our mission is to help your dealership thrive. To learn more about how we can help your dealership, click here.